Those who have shared or engaged with content online relevant to Ford’s campaign will be served relevant mobile ads whilst in the vicinity of Ford's billboard ads. By targeting people through their location and content sharing behavior, the Fiesta will reach people who would be more likely to be interested in it. 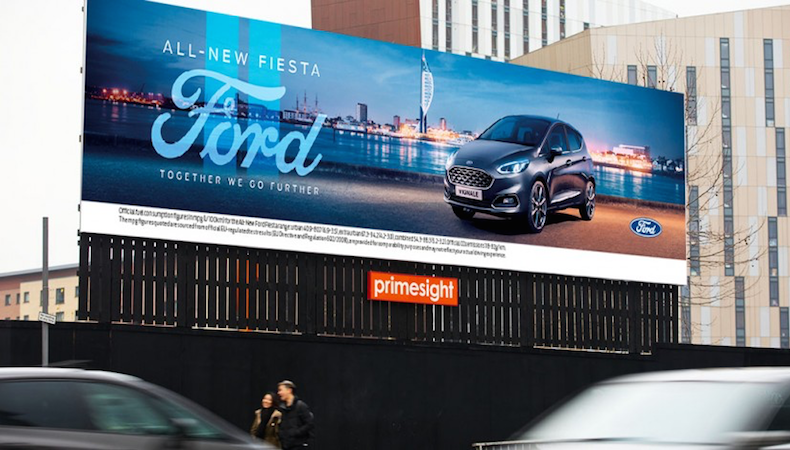 “We were drawn to this opportunity with Primesight and RadiumOne as it allows us to combine our OOH and mobile campaigns by including an additional layer of audience targeting to facilitate conversions,” said Rachel Moore, media manager at Ford, in a statement. By combining RadiumOne’s sharing data with data from Route – the out-of-home industry audience measurement standard in UK – it allows the campaign’s reach to be extended beyond people in the vicinity of the poster. “It’s about fusing geo-location data from mobile and OOH planning tools with sharing data to find highly relevant audience profiles for Ford,” said Craig Tuck, UK managing director of RadiumOne, in a statement. RadiumOne is a marketing company that works with brand’s paid, earned, shared and owned assets to find and connect with high-value consumers. Primesight, owner of out-of-home media, has focused recently on the development of digital billboard locations in cities throughout the country. “We're always looking for new and innovative ways to drive efficiencies and performance for Ford through our media plan,” said Tom Marsden, account director at Mindshare, in a statement.